A throwback to '90s fanny packs, this updated bag is covered with repurposed Kutch textiles from India. Everybody loves a good comeback story, especially served with a sprinkle of nostalgia. After years of being "as if! 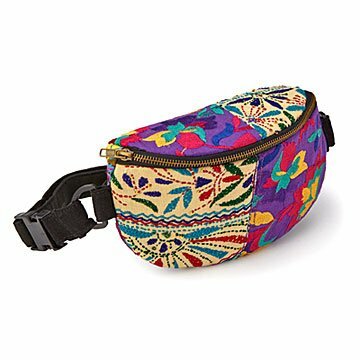 ", the '90s fanny pack is totally rad again, with much nicer fabric and a more dignified name: waist pack. Covered front and back with repurposed, colorfully embroidered Kutch and Suzani textiles from India, it instantly converts to a crossbody. But deep down, it's the same convenient, zippered carryall it was back in the day. Handmade by women artisans in India. Bag Measures 9.5" x 6" Strap is 32" adjustable to 48"